US Secretary of State John Kerry says there is overwhelming evidence of Russian complicity in the downing of a Malaysia Airlines plane in Ukraine.Mr Kerry called on Russia to take responsibility for the actions of the rebels, saying their handling of the dead had been “grotesque”. Earlier, the remains of up to 196 people were loaded on to refrigerated rail wagons in eastern Ukraine, to be taken to an unknown destination. Australia’s Foreign Minister Julie Bishop has called on pro-Russian separatists not to use the bodies as pawns in their conflict with the Ukrainian authorities. Mr Kerry said the US had seen major military supplies moving into Ukraine from Russia in the last month, including a convoy of armoured personnel carriers, tanks and rocket launchers. Intercepted calls suggested a Russian SA-11 missile system had been transferred to the rebels, Mr Kerry said, and the US had seen a video of a launcher being moved back into Russia after flight MH17 crashed. “There’s [an] enormous amount of evidence that points to the involvement of Russia in providing these systems, training the people on them,” Mr Kerry said on a US TV network. He also threatened further sanctions on Russia and called on European allies to get tougher with President Putin after the “wake-up call”. Writing in a newspaper on Sunday, UK Prime Minister David Cameron said Europe and the West “must fundamentally change our approach to Russia” if Mr Putin “does not change his approach to Ukraine”. The indiscipline and chaos of the last two days have been replaced by the robust presence of former riot policemen who now form a cordon around the central area of the crash site. There is still no sign of the fully fledged independent investigation which is being demanded by the international community. During the morning local volunteers have been searching the fields. We have been told that their job is to pinpoint belongings and remains to the emergency services. But this could easily have the effect of disturbing evidence important to an inquiry. As for the strong words from British Prime Minister David Cameron attacking Russia they are likely to have little impact on the rebels here. They are contemptuous of the West and are much more concerned with the local military balance than with any warnings from London. Mr Kerry’s comments joined a chorus of anger directed at Russian President Vladimir Putin after the rebels in charge of the crash site restricted access to the plane’s wreckage and its victims. The remains of up to 196 people were loaded on to refrigerated rail wagons at the crash site in Grabove on Sunday, three days after the Boeing 777 came down. The freight train is now standing at Torez railway station, 15km (nine miles) from the crash site. The carriages, with heavy closed doors, look like refrigeration units and there is the occasional smell normally associated with dead bodies, the BBC’s Richard Galpin reports from Torez. Speaking in Donetsk, the biggest rebel-held city in the east, rebel leader Alexander Borodai said the bodies would remain in Torez until international aviation inspectors arrived. The rebels say they will hand over MH17′s flight recorders to the International Civil Aviation Organization but the US state department said rebels had tampered with other potential evidence. Heavy machinery could be seen moving plane debris around at the crash site on Sunday. Malaysian Transport Minister Liow Tiong-Lai, who arrived in Ukraine’s capital Kiev at the weekend, said he was “very concerned” that the crash site had been “severely compromised”. A Malaysian team of 133 officials and experts, comprising of search and recovery personnel, forensics experts, technical and medical experts have also arrived in Ukraine. 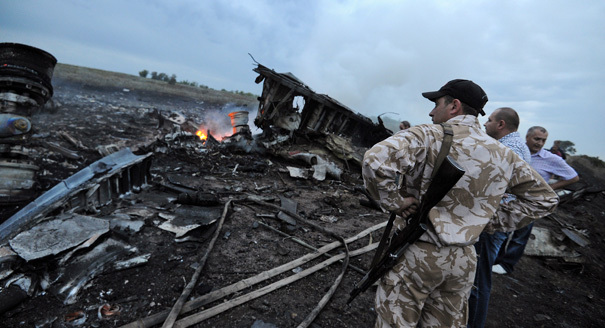 But the government in Kiev says it has been unable to establish a safe corridor to the crash site for the group. Fighting remains ongoing in eastern Ukraine between the separatist rebels and government forces in a conflict which erupted in April and is believed to have claimed more than 1,000 lives. The passenger list released by Malaysia Airlines shows the plane was carrying 193 Dutch nationals, including one with dual US nationality. Other victims included 43 Malaysians (including 15 crew), 27 Australians, 12 Indonesians, 10 Britons, four Germans, four Belgians, three from the Philippines, and one from both Canada and New Zealand. Memorial services and vigils were held on Sunday in many countries, including Australia, Malaysia and the Netherlands.